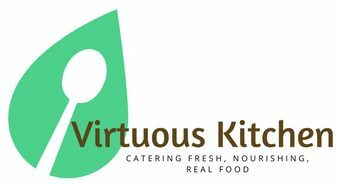 Virtuous Kitchen – Fresh. Nourishing. Real Food. Virtuous Kitchen takes pride in using fresh, wholesome, real food. We strive to use local, seasonal and organic produce, meat and dairy when possible. Our kitchen only cooks food that we would be happy to serve to our family and children! At our store front, located in Cambridge, Ontario (specifically Preston), you will find a tiny bistro that offers healthy soups made from scratch and using our house-made bone broth as a base. We also have a variety of premium sandwiches, free from preservatives, nitrates and food colourings. We cook and season our chicken breast and roast beef in-house for our sandwiches. A small variety of gluten-free, keto and paleo friendly baked goods are also available such as cheesecake, scones, carrot cake, peanut butter squares and almond flour brownies! We only use healthy fats such as, real butter or organic coconut oil. Virtuous Kitchen also provides buffet style catering that is fresh, wholesome, and real! No powdered mashed potatoes or cans of pre-made gravy will be found in our kitchen. We make all meals from scratch and will customize the menu to fit your various dietary needs such as gluten free, paleo, keto, whole30 or simply a good old fashioned hearty meal. We will deliver and setup at your venue or you can pickup here. Other exciting happenings in our kitchen include our Kids Kitchen Cooking Club, our Mason Jar Soup Club, our Custom Healthy Meal Planning & Prepping, Frozen Meals, Cooking and Nutrition Based workshops such as fermenting Kombucha & Making your own Sauerkraut, Bone Broth by the jar or mug, Private Kids Cooking Parties, and lastly Certified Commercial Kitchen Rentals. We would love to connect with you! Stop by our location in Preston, Ontario at 739 King Street East, Cambridge, Ontario, N38-3N8 or call 519-653-9222.